In September 2012, I wrote about the Voynich mystery. The Voynich Manuscript is a detailed 240-page book written in a language or script that is completely unknown. It is named after the Polish-American antiquarian bookseller Wilfrid M. Voynich. He acquired it in 1912. The pages are filled with colorful drawings of strange diagrams, odd events and plants that do not seem to match any known species. The appeal of the manuscript is impossibility to decipher it. Many scientists are still trying to crack the Voynich code. One of them is Jorge Stolfi, a professor of computer science at the State University of Campinas, Brazil. He was able to compose a grammar for Voynichese and concluded that it behaves like a natural language, more so than like a code, as many others believe. But Andreas Schinner, a theoretical physicist, argues that the non-randomness of syllable distribution is a strong indication that it is a hoax, not a natural language. He concluded that the “language’ is very different from human writings, even from ‘exotic’ languages like Chinese. In fact, the results better fit to a ‘stochastic process’ (a sequence of correlated random events).” In an article in Cryptologia, he concluded that the Voynich contains no encrypted message at all. Psychologist Gordon Rugg agrees that it is a hoax. This creates a new mystery – why would anyone create such a manuscript? Creating a hoax for profit? The main suspect for penning a hoax manuscript is Edward Kelley who had a track record of creating made-up languages and perpetrating frauds and hoaxes. As a convicted villain, he had his ears cropped for forgery. However, the Voynich Manusript shares many similarities with Francis Bacon’s New Atlantis, a 17th-century utopian tract about a fantasy island. In it, Bacon’s ideal college is described, including the unknown plants, the grafting, the code, books on velum, and new types of animals, as well as a bath full of naked ladies. For now, the Manuscript keeps its secrets, although many experts believe that the key to the Voynich manuscript is just around the corner. Let’s wait and see…I will keep you posted! Although Macy’s apologized for the error, no explanation why it happened was given. 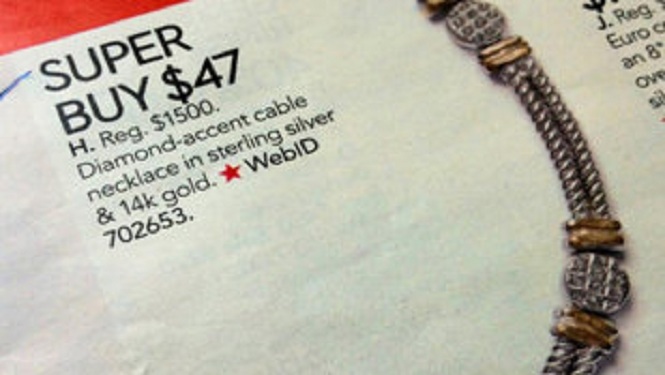 The copywriter who made the catalog mistake was recently fired, quite likely as a result of missing the typo. If so, this is unfair. As all copywriters know, it’s difficult to proofread your own work. In this case, where missing a digit results in financial loss, clever companies would have another writer or editor proofreading the copy. Was Macy’s in this case “penny wise, pound foolish”? We will never know. Cynical marketing minds suspect that Macy’s did not make an honest mistake, but that is was a publicity stunt. If that is the case, Macy’s has for sure succeeded – the media coverage was enormous. Initial covered by wfaa.com, it quickly went viral and was featured on several TV stations. The main story is a human interest one – Robert Bernard tried to buy the necklace for his wife at the Collin Creek Mall, but a customer in front of him bought the whole stock. (A marketing blunder – normally bargain offerings limit the amount of items a customer can buy). According to Bernard, the clerk offered to sell Bernard two of necklaces for $47 and have them shipped to his home. Total Savings was $1,400, his receipt reads. This does not make sense, since Bernard claimed that he wanted to buy one necklace as an anniversary gift. No matter what, this incident underpins the importance of professional copywriting/marketing writing and editing!